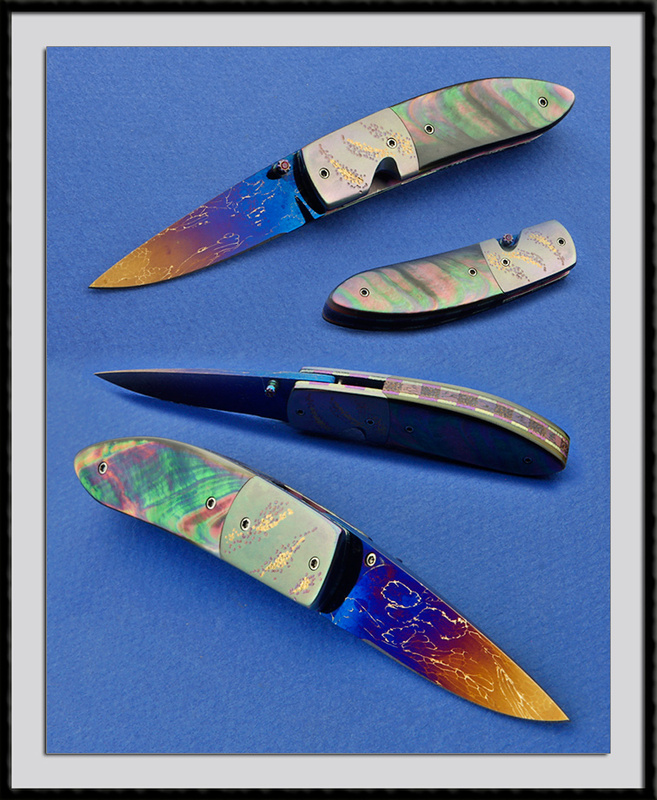 A member of the South African Knife Makers Guild, Theuns Prinsloo is a full time knife maker and world known Artisan. His use of high grade Natural materials, careful attention to detail, and a superior skill for precision fit and finish are his calling card all of which are evident in this Liner Lock Folder. BL = 2 5/8", OAL = 6 3/8", Hollow ground Hot Blued High Carbon 1070/1095/Nickel Damascus Blade forged in Theun's shop, Dovetailed-Stippled-12c27 Ti Bolsters, Stippled Purple & Gold anodized 12c27 Ti Liners, stippled Ti Back Spacer and a Heat Colored Thumb-Stud with a Ruby inlay with black Lip Pearl scales, SS Torx Screws,. You will find African Primitive Art Work on the outside and inside of the Back Spacer were the maker also has his Mark. Action is Smooth and precise with a closed position detent. Fit and finish is second to none.